The Firm would like to congratulate Core Campus on its recent completion of two significant student housing developments located adjacent to two major US universities. The company’s “Hub” projects at the University of Arizona in Tucson (pictured above on the left) and the University of Wisconsin in Madison (pictured above on the right) were recently featured in BisNow as being among the top luxury student housing properties in the country. Both Hubs feature an array of indoor and outdoor amenities as well as exquisite architecture and interior design. Following the Core Campus development goals, both Hubs are modern buildings with modern amenities that are in tune with the needs of today’s college students. The Hub at the University of Arizona and The Hub at the University of Wisconsin both include impressive amenities that anyone, not just college students, would approve of. Each unit in both Hubs includes a private bed and bath, washer and dryer, a fully equipped kitchen and more. That’s just the beginning though. Arizona’s Hub includes gaming rooms, a fitness center, meeting rooms, a spa, and a rooftop with a sundeck, infinity pool, LED TV, grilling gazebo, and sand volleyball court with stadium seating. 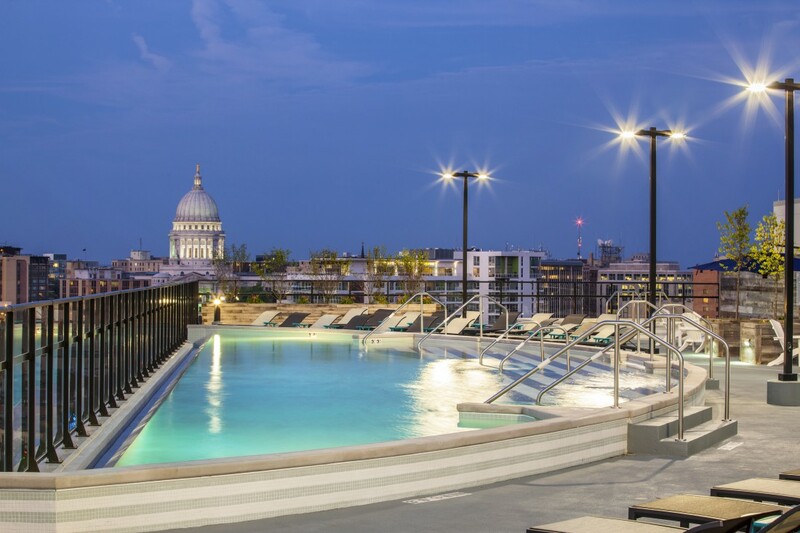 Wisconsin’s Hub is just as notable with a spa, fitness center, indoor golf simulator, multipurpose rooms, climate and access controlled garage and a rooftop sundeck with a pool, LED TV, sand volleyball court, hot tubs, cabanas, and a seasonal ice rink. Beyond just the standard amenities, Wisconsin’s Hub also includes upgraded individual units with dry bars, private hot tubs, and wireless sound systems. 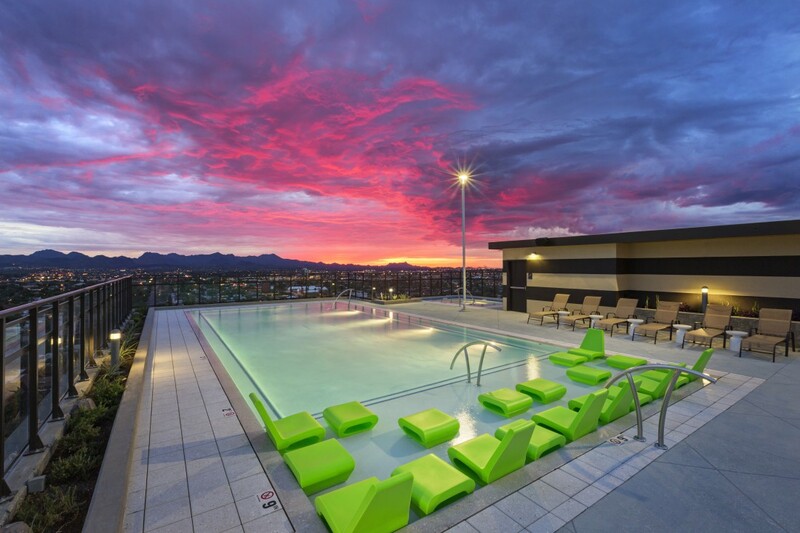 Core Campus, the student housing arm of Chicago-based Core Spaces, entered the student housing market in July 2013 with the first Hub at Arizona State University in Tempe, Arizona. The company’s goal for Hub is to rethink student housing by developing living spaces designed for every aspect of college life: academics, wellness and community on multiple campuses across the nation. The company believes that students deserve all of the comforts of home — and then some, which is why they offer acquisition, development and in-house management services to deliver student housing tailored to the needs of students, parents, universities, and the local communities where they invest. The company is well on its way to changing the way people view the standard college apartment. For more information on related matters, please contact Joe von Meier at jvonmeier@burkelaw.com or 312/840-7063.